Liverpool set up a League Cup semi-final meeting with Chelsea as Raheem Sterling scored twice to see off Championship leaders Bournemouth. The makeshift striker nodded in the opener after Callum Wilson missed a glorious chance to put the hosts ahead. Lazar Markovic's precise finish doubled the lead, but the Reds were thankful for Yann Kermorgant's glaring miss. 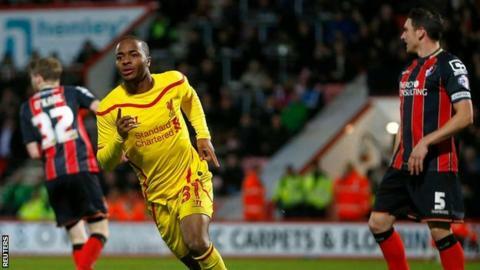 Sterling stroked in after the break and, although Dan Gosling bundled in to set nerves on edge, the Reds held on. The victory should provide a shot of confidence for a Liverpool side that had won only two of their previous 10 games and face an in-form Arsenal in the Premier League on Sunday. It was a welcome boost for Liverpool manager Brendan Rodgers, who has come under pressure following his team's poor start to the season and last week denied reports of dressing room unrest. Sterling's brace was the first time he has found the net for his club since September and, after missing a succession of chances in last weekend's 3-0 league defeat by Manchester United, he looked more composed in a new central role. With Liverpool 11th in the Premier League and Bournemouth topping the Championship on the back of a 12-match unbeaten run, only 10 league places separated the sides at kick-off. But, after Wilson stabbed wide with only goalkeeper Brad Jones to beat, the visitors made that narrow gap feel like a chasm in class. Liverpool have won three of their five previous League Cup ties against Chelsea, including the most recent one, when Martin Kelly and Maxi Rodriguez scored in a 2-0 quarter-final win at Stamford Bridge in November 2011. Chelsea's 3-2 extra-time win over Liverpool in the 2005 final secured Blues boss Jose Mourinho his first trophy in English football. Liverpool dominated possession and had threatened through Adam Lallana and Steven Gerrard's crisp long-range strikes when Sterling capped a 52-pass move with the opener. Sporting a newly shaved head, the 20-year-old stooped to glance home a close-range header after Markovic's deep cross had been nodded into the six-yard box by Jordan Henderson. Liverpool's second goal stemmed from Bournemouth defender Tommy Elphick turning his back on Philippe Coutinho, apparently distracted by a whistle from the crowd. The Brazilian's shot was blocked by goalkeeper Artur Boruc, but the ball ran to Markovic, who thumped a half-volley through a forest of legs and into the bottom corner from 15 yards. Bournemouth's Simon Francis burst down the right and squared for Kermorgant, but the Frenchman blazed over with the goal gaping and under little pressure. With the Bournemouth defence pushing a higher line after the break, England international Sterling exploited the space in behind, twisting and turning Elphick before rolling home a composed finish. Liverpool were briefly shaken when Matt Ritchie's cross was ushered past Martin Skrtel and Kolo Toure by former Everton player Gosling, whose shot beat an unconvincing Jones. Although Gosling hit the upright with a curling effort, Liverpool closed out the game in relative comfort. Bournemouth boss Eddie Howe: "We showed our quality, showed we can create chances against a good team, but you have to admire their quality - they have world-class players. "We were too open and got caught between two stools, of pressing and getting a good block on. "We tweaked things at half-time - we took a risk with two strikers but we wanted to be positive. We were at home in a cup tie and wanted take the game to Liverpool to give it a go." Match ends, Bournemouth 1, Liverpool 3. Second Half ends, Bournemouth 1, Liverpool 3. Attempt saved. Matt Ritchie (Bournemouth) right footed shot from outside the box is saved in the centre of the goal. Substitution, Liverpool. Fabio Borini replaces Steven Gerrard. Attempt missed. Raheem Sterling (Liverpool) right footed shot from outside the box is close, but misses the top right corner. Attempt saved. Baily Cargill (Bournemouth) header from the centre of the box is saved in the bottom right corner. Assisted by Ryan Fraser with a cross. Attempt blocked. Ryan Fraser (Bournemouth) left footed shot from outside the box is blocked. Assisted by Matt Ritchie. Hand ball by Steven Gerrard (Liverpool). Corner, Liverpool. Conceded by Baily Cargill. Substitution, Bournemouth. Brett Pitman replaces Eunan O'Kane. Attempt missed. Simon Francis (Bournemouth) right footed shot from outside the box is too high. Assisted by Matt Ritchie. Offside, Liverpool. Steven Gerrard tries a through ball, but Jordan Henderson is caught offside. Foul by Eunan O'Kane (Bournemouth). Attempt missed. Harry Arter (Bournemouth) right footed shot from the left side of the box is high and wide to the right. Assisted by Ryan Fraser following a corner. Corner, Bournemouth. Conceded by Kolo Touré. Attempt missed. Matt Ritchie (Bournemouth) left footed shot from the left side of the box misses to the right. Assisted by Adam Smith. Dan Gosling (Bournemouth) hits the left post with a left footed shot from the centre of the box. Assisted by Adam Smith. Corner, Liverpool. Conceded by Tommy Elphick. Attempt missed. Raheem Sterling (Liverpool) right footed shot from the centre of the box misses to the left. Assisted by Adam Lallana. Attempt missed. Ryan Fraser (Bournemouth) header from the centre of the box is close, but misses to the right. Assisted by Eunan O'Kane with a cross. Corner, Liverpool. Conceded by Eunan O'Kane. Philippe Coutinho (Liverpool) wins a free kick on the right wing. Goal! Bournemouth 1, Liverpool 3. Dan Gosling (Bournemouth) left footed shot from the centre of the box to the bottom left corner. Assisted by Matt Ritchie. Attempt missed. Philippe Coutinho (Liverpool) right footed shot from outside the box misses to the left. Assisted by Adam Lallana.